Via gameSniped.com (as was the last post, I think I forgot to credit them!) comes news that Yogi’s Frustration, the unreleased Intellivision game starring Yogi Bear, is for sale on ebay. 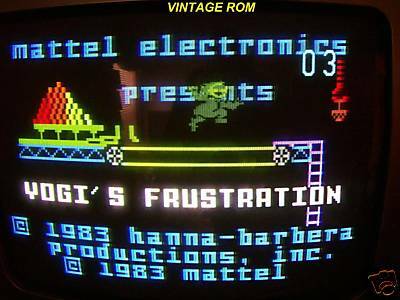 Yogi’s Frustration (sometimes titled Yogi’s Adventure, Yogi and BooBoo or, disturbingly, Yogi’s BooBoo) was the result of Mattel’s marketing department acquiring a handful of licenses and trying to apply them to games already in development - in this case, a game with a completely original IP called Modern Times, then being coded by Mark Buczek. According to Intellivision veterans (and current owners) the Blue Sky Rangers, the game itself tested well, but the inclusion of Yogi and Boo Boo characters did not, proving once again that you should ignore your marketing department in all creative matters. I haven’t seen this game in action since Classic Gaming Expo ‘99 (photos here, you might even find a chunky 17-year-old me somewhere), and that was the Rangers’ personal copy, which they of course can not legally sell or distribute without paying licensing fees. As far as I’m aware, this is the only privately-owned copy ever for sale. The auction has a buy it now of $9,995, but I don’t think the seller is honestly expecting that much - in fact, he is taking offers.